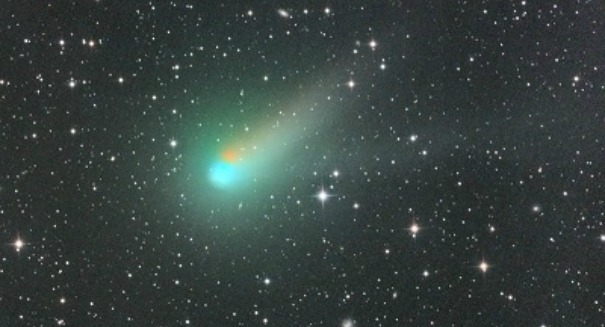 A comet like this one may have had a catastrophic impact with Earth 55.6 million years ago. A massive comet may have slammed into the Earth millions of years ago, an event that would released huge amounts of carbon into the atmosphere and caused the global temperature to spike by as much as 8 degrees Celsius — that’s what a new study published in the journal Science is claiming. The comet strike happened about 55.6 million years ago, during the Paleocene-Eocene Thermal Maximum, and would have resulted in oceans becoming more acidic and higher sea levels, with hundreds of species going extinct, according to a Earth Institute at Columbia University statement. It’s a fascinating discovery because it’s the best analog available to the current situation of climate change today, although this event had a very different cause the humans burning fossil fuels. Scientists are basing this discovery on tiny glass globules in rock core samples from New Jersey to Bermuda, which suggests a catastrophic comet impact raining debris over a wide area. The glass sphere are called microtektites and are the remains of molten rock blown in the air during a collision with Earth.